Less than a decade ago, no one talked about limited social contact within organizations unless individuals or groups became too conspicuous for the company’s liking. However, social networking websites, such as Facebook, have changed the rules of social engagement in today’s corporate world. Many employers see such social networks as a threat. While we cannot contest the utility of social networks for job seekers and recruiters, more and more employers around the world are frowning at employees using Facebook, Twitter and other similar websites while at work. It should come as no surprise to anyone that many companies block social networking sites completely on their internal networks. According to a social media infographic, most companies readily take on the idea of using social networks for promoting their brands and their image. However, when it comes to employees using the same, some companies fear negative information (classified or otherwise) and comments people sometimes make on social networks without fully realizing their implications. Another reason for blocking social networks is low productivity created by continuous distractions. Social networking can be addictive to the extent that some people may actually spend several hours a day receiving updates from people in their networks, posting status updates, playing games and finding long-lost friends. At a time when multitasking and tight deadlines are the name of the game, the last thing an employee can afford is a distraction, especially when we have enough work-related distractions. Such time wasters can cost companies huge revenues losses over extended time periods. 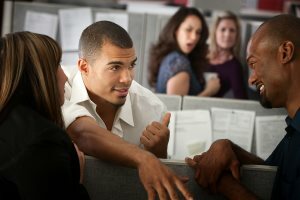 More than 50 percent of U.S. employers have a formal policy about social networking at work while 42 percent completely reject the idea that employees should be socializing during working hours. The trend is observed more in small and medium enterprises compared with larger corporations. Customer support, manufacturing and retail businesses discourage social media usage while media outlets encourage the trend for obvious reasons. Energy companies are reportedly among the most hostile against social networking at work. For recruitment, some 65 percent of small businesses confess to using social networks to find their next employees. Fifty-one percent of medium-sized businesses utilize social networks for recruiting whereas 44 percent of large companies use social networks for hiring. Of these companies, 80 percent used LinkedIn as their preferred recruitment network. Wholesale, construction and real estate are least likely to use social networking for recruitment. The infographic goes on to add that such employer attitude contradicts employee expectations pertaining to social networks. More than 50 percent of the workforce demands access to social networks at work for varied reasons. This is true not only for the new recruits who represent Generation Y but also for members of Generation X who also reportedly use social media at work every day. Whatever your company’s attitude toward social networking may be, it pays to be familiar with it and adhere to it. In case you don’t see any policy or have doubts about some aspect of it, talk to your supervisor or HR manager immediately. As an employee, one must also be careful about what you post on your social networking profile and who you share it with. We must remain professional and remember that people in our professional network can also see our personal posts. We must set personal limits to using social networks and use such networks to advance our careers.